Impressive. Once you come out of the underground, which is on the Jubilee line, you find yourself in a futuristic area full of sky scrapers and high-rises, including the highest one in the United Kingdom. Mainly a commercial office area, great efforts are being made to transform the old docklands into a new city. 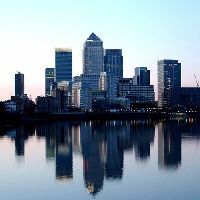 This is London's new business and financial district and where most of its newspapers have relocated from Fleet Street. It is also home to the ill-fated Millennium Dome. Not much residential housing at the moment but there are some interesting new developments along the river in old warehouses, and new river-side houses with their own yatch basins. In addition to the underground, there is also the Docklands Light Railway with links to London City and Gatwick airports. It is still too new to have much a charcter of its own and it has an abandonned feel in the winter evenings, but in th summer it comes into its own. A popular place to live among foreigners working in this new financial district.